Eva Longoria (once again) looks fabulous running errands around town!! 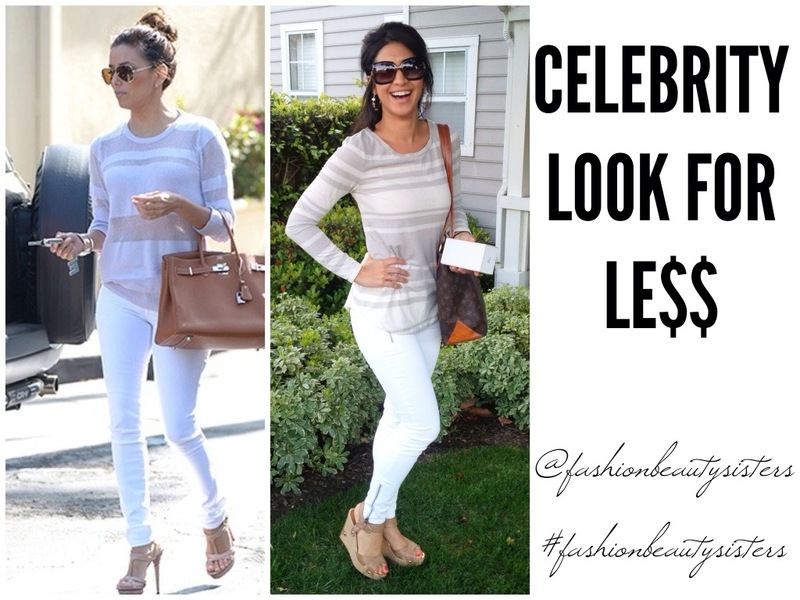 Here’s the Celebrity Look for Less that I threw together. *REMEMBER: I only use pieces that I already have in my closet for Celeb Look for Less; I don’t buy new things for it. I hope it gives you fun ideas for how to remix your wardrobe, and look like a star too! I’m so happy with how well-matched the outfit came out! Details (prices approximate)… SHIRT: Old Navy, $13 // PANTS: Bebe, Matte Coated Zipper Skinny Jean, $129 full price, but I bought them on sale, with a promotional discount, and gift card, so they were much cheaper (always work a deal, ladies!!) // SHOES: Ivanka Trump, wedge sandal, $135 full price, but again working the deal, I found them at both on amazon.com and DSW for $40.00. // ACCESSORIES: Glasses, Dior. Earrings, Kendra Scott, Heather Earrings in Slate.